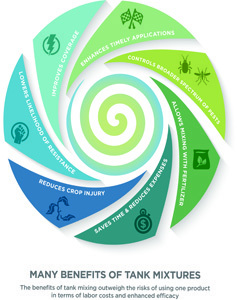 Discovering and developing new active ingredients for pesticides is very complex and expensive. The cost to discover, register, and introduce a new active ingredient to the market can exceed $300 million and often requires eight to 10 years. These investments are risky, because commercial success is never guaranteed. New products are important to help growers deal with resistant insects, diseases, and weed infestations. All new products must undergo safety review processes from regulatory agencies wherever the product is sold — the Environmental Protection Agency in the United States and the Pest Management Regulatory Agency of Health Canada. These processes require companies to support coordinated discovery and product development teams. These teams include formulation chemists, chemical engineers, and synthetic chemists who work together to develop active ingredients and end-use formulations. In addition, companies also require field biologists, environmental chemists, toxicologists, and business and marketing personnel to direct new product development. The active ingredient’s physical properties heavily influence the final commercial product formulation. It is the physical properties of the commercial formulation that dictate how the product responds to temperature, water pH and hardness, storage conditions, and how the product mixes in common liquid carriers for spraying (such as water, crop oils, and fertilizers). When you follow the correct mixing order and other mixing principles, you can avoid creating problems like this in the spray tank. The process of refining and optimizing formulations to overcome performance issues is complicated. Sometimes, companies solve one formulation problem but create another. Formulations undergo rigorous testing both in laboratories and under field conditions to preserve pesticide efficacy. Once a company formulates a product, they can test it with other products. 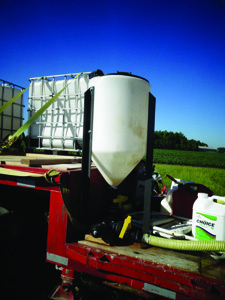 The tank-mix partners a company selects for testing represent products that growers or commercial applicators might apply during the growing season. However, manufacturers cannot test all the possible tank mixes applicators can conceive. Even after a company develops and tests a new product, there are certain processes for mixing the products together properly to ensure that they work effectively. This publication focuses on how several factors influence product compatibility. It is important to understand these basic factors (including formulation, tank mixing order, and carrier type) to help you effectively combine crop protection products. If you don’t mix products together the right way, you will encounter costly and time-consuming problems with your mix. Collectively, these problems are called incompatibilities. It is often difficult to visually observe pesticide reactions to water pH. For instance, this pesticide mixture changed color when using water with a different pH, which may indicate a chemical compatibility problem. The manufacturer must test to determine whether the color change reduces the product’s efficacy. 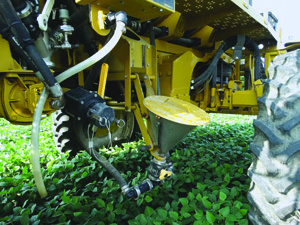 It is a common practice to combine multiple crop protection products into a single spray application. This practice is called tank mixing. 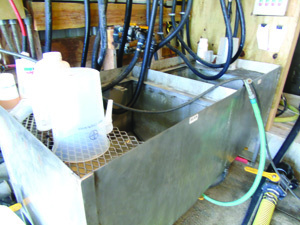 The primary benefits of tank mixing are efficiency and convenience. • Decrease the likelihood of pesticide resistance by applying products with multiple modes of action together. 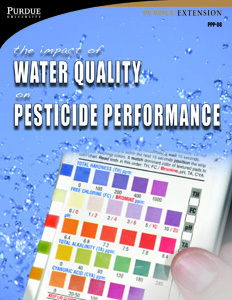 Most spray applications use water as the liquid carrier, but water quality can vary greatly. Specifically, water’s pH, mineral content, and temperature can influence how chemicals dissolve, suspend, interact with one another, and generally perform. Therefore, it is important to consider the water source when tank mixing. Each formulated product has a set of complex chemical structures. As a result, each tank-mix partner you add increases the potential for incompatibilities (negative interactions). Incompatibilities arise when one product influences how other products in the mixture disperse, mix, and deliver. 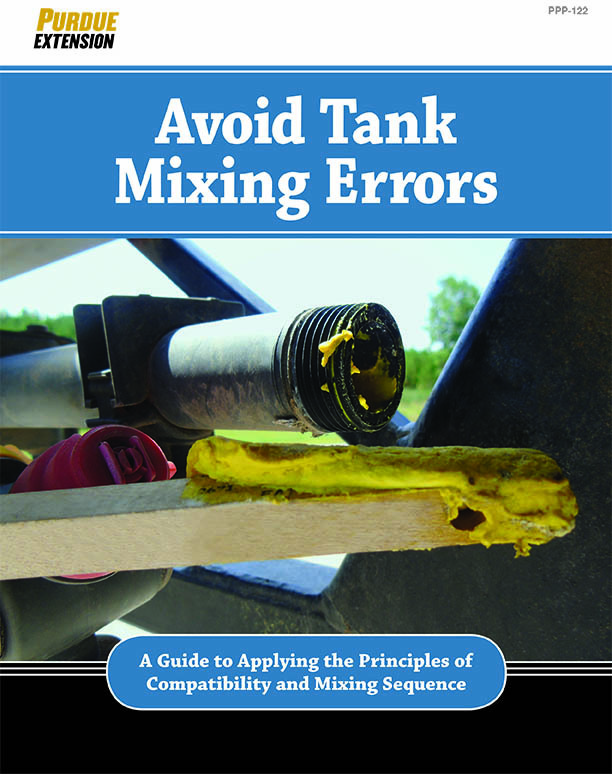 There are two basic kinds of tank-mix incompatibility: physical and chemical. Tank mixes with physical incompatibility problems may separate into layers (that is, oil and water), and solids may settle faster than normal. In severe cases, physical incompatibility may cause the solution to form gels or cause solids to clump. When these things happen, operators may have to drain and flush the tanks, and then remove and clean all filters, screens, and nozzles. a cake-like layer that accumulates on the bottom of the tank or that can form particles that can clog screens. • Undissolved materials that clog screens and nozzles. • Liquid solutions curdle and thicken into a paste or gel that make it difficult to clean the tank. • Active ingredients that separate into distinct layers in the spray tank. • Excess foaming from trapping air in the tank mixture. Physical incompatibility can cost you time and effort while you clean out gels, solids, and hard-packed sediments. Additionally, it can be expensive to remediate or safely dispose of the residues and any rinsates you generate while cleaning the sprayer. 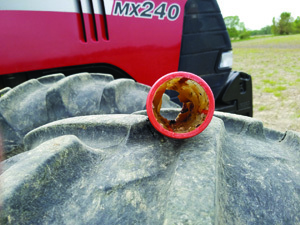 In severe cases, if you don’t clean out the equipment completely, you can damage the crop. Chemical incompatibility can negatively affect spray quality, product uptake, and plant surface retention of the application. 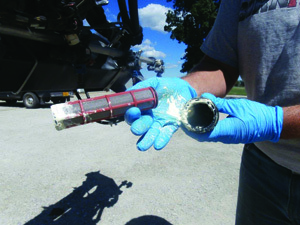 The effect of a chemically incompatible tank mixture may not always be obvious. Visible crop injury (phytotoxicity) may occur a few hours to several days following an application. Sometimes, reduced efficacy is the only observable effect of chemical incompatibility. This may require additional applications, and can decrease yield, harm crop quality, or both. 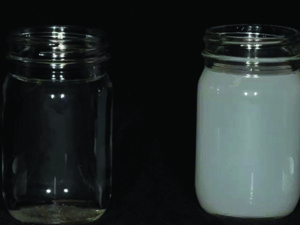 The jar on the left shows glyphosate dissolving in distilled water. 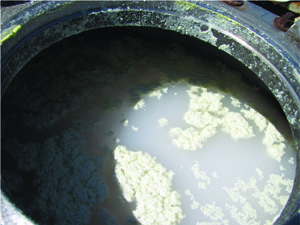 When the water contained high levels of minerals in hard water, the glyphosate molecules can bind to the minerals as shown by the cloudy water (right). When this occurs, the glyphosate is bound to the hard water ions and unavailable as an herbicide even though the full rate was put into the tank. Chemical incompatibilities such as these are not always visible. Most chemical incompatibilities arise from surfactants in the tank mix that are not compatible in mixtures. For example, an oil adjuvant added to an herbicide can increase cuticle penetration, but it also can impact herbicide activity that may result in scorching or bleaching on crops that might not otherwise be affected by the active ingredient. Ever wonder why an application did not work as well as it should have? The failure might be linked to a chemical incompatibility. When discussing pesticide products, it is common to focus on active ingredients; however, they are only one component of a formulated product. Physical compatibility problems may not directly involve an active ingredient. Rather, inert ingredients (co-formulants) in the product may cause incompatibility. In dry wettable granule (WG) and soluble granule (SG) formulations, inert ingredients primarily help dissolve or disperse the active ingredients in a solution. 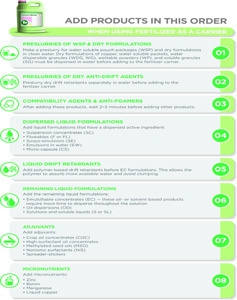 In liquid formulations, inert ingredients may include emulsifying surfactants, oils, solvents, preservatives, and thickening agents that prevent particles from settling. 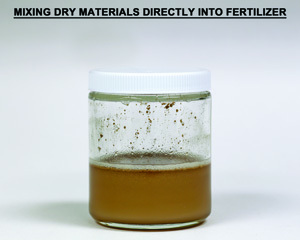 Dry formulations are often the culprit for physical incompatibilities during mixing. Inert ingredients in dry, water dispersible formulations (WDG or WG) allow the product to rapidly and uniformly disperse in water and form small particle suspensions within a tank mixture. As these dry formulations dissolve and granule pores absorb water, the granule breaks apart into smaller particles. These smaller particles (primary particles) are 2 to 10 microns in size and can easily pass through screens and nozzles. to cover the area or for the plant to uptake. Besides mixing order, agitation can be an issue. Formulated products that dilute into fine particle suspensions tend to settle out on the bottom of the spray tank when spray tank agitation is inadequate. If the particles remain settled out for an extended time, it can be difficult (or impossible) to resuspend these materials. 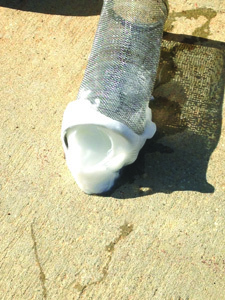 After this happens, obstructed hoses or piping may also prevent the product from being remixed. The more tank-mix partners you add, the greater potential for incompatibility. 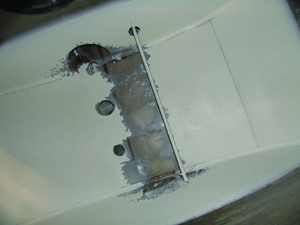 A tank-mix incompatibility can be costly. There is the additional cost and difficult task of cleaning out the sprayer, plus you may have to make repeated applications to control the original pest problem. 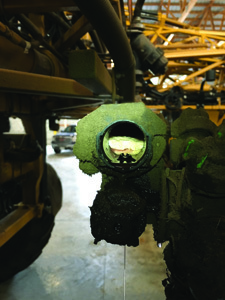 An incompatible tank mixture may leave residue in the tank, which if not cleaned thoroughly may cause problems later — with cross-contamination and other incompatibility or efficacy issues. 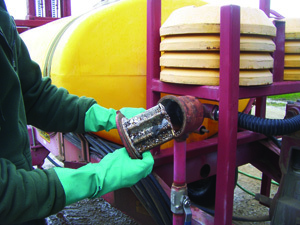 Incompatible tank mixtures may increase the time required to clean residues out of the sprayer. 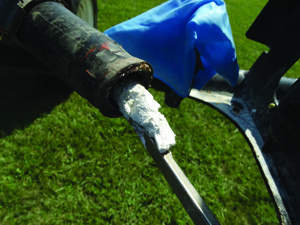 Instead of making a faster and more efficient application, this applicator has a mess to clean up. It is important to always wear personal protective equipment when dealing with physical incompatibility problems just as you would when mixing and spraying the products. 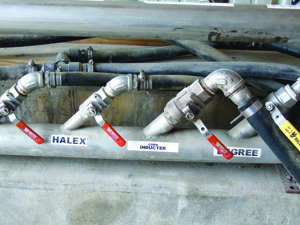 The key to creating a stable tank mix is understanding the factors that influence compatibility. 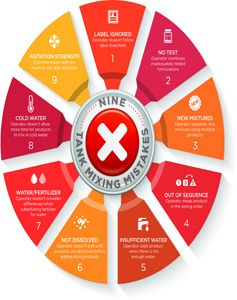 Below, we describe eight factors that will help you avoid tank-mix incompatibilities. Formulations such as suspension concentrates (SC), oil dispersions (OD), suspo-emulsions (SE), and capsule suspensions (CS) contain active ingredients that can separate into layers. The layering effect is similar to what you might see in a bottle of Italian salad dressing or a can of oil-based paint if you leave them undisturbed for an extended time. Before you add this (or any product) to your tank, check the container or storage tank. These pesticide products require a thorough mixing before you use them. When you ensure that the content inside the containers is homogenous (uniform), you also ensure that the active ingredient(s) and inert materials are appropriately distributed throughout the container before you add them to the spray tank. The manufacturer checks and validates this information and communicates it to customers through product labels, websites, fact sheets, technical bulletins, and user group presentations. It is in your interest to benefit from all this information by carefully reading product labels before you start mixing. It is critical to understand label directions. Furthermore, since labels change, applicators should read the label each time they purchase a new product. Manufacturer websites and customer service links are useful resources you can check when dealing with compatibility. Understanding the order in which you should add tank-mix partners can reduce physical incompatibility. Moreover, knowing how the active ingredient will disperse or dissolve will ensure a compatible tank mix. 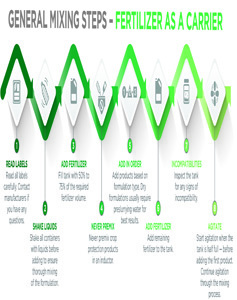 One type of soluble active ingredient formulation is soluble liquid (SL). Generally, manufacturers prepare these formulations as salts of the active ingredients. This formulation type is water-based, so when you add it to a spray tank, you dilute the SL even further. A solubilized active ingredient remains dissolved in solution when it is concentrated in the jug or after you mix it with spray water. You need only mild agitation. 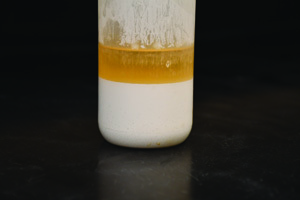 Other examples of soluble active ingredients include oil- or solvent-based formulations — such as emulsifiable concentrates (EC) and microemulsions (ME) — where the active ingredient remains dissolved in solvent. These solvent-based formulations require you to add emulsifying surfactants to the formulation concentrate to prevent rapid oil/water phase separation. 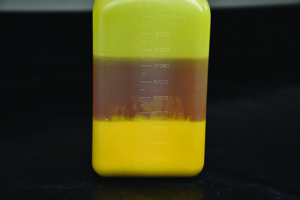 With phase separation, the solvent-dissolved active ingredient oil layer floats to the top of the tank and forms a distinct and separate layer from water. To avoid this mixing issue, emulsifying agents are added to the formulation to reduce the oil-on-water emulsion separating into layers. 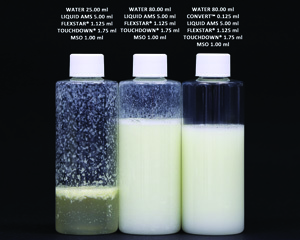 These emulsifiers create a milk-like emulsion by keeping the oil droplets small and numerous in order to create a uniform diluted spray mixture. A soluble liquid formulation that contains predissolved active ingredients means there will be less settling in an unagitated spray tank. However, there are limits to solubility. Once water reaches its saturation concentration, any remaining product will fall out of solution — just like if you add too much sugar to iced tea. A dispersed active ingredient reduces the solid active ingredient to a very small particle size, then either suspends these particles in a water-based liquid (SC or suspension concentrate) with a thickener or clumps these small particles to prepare a water dispersible granule (WG) formulation. In both cases, the active ingredient remains a particle from the container through application. In general, solid active ingredient formulations are not very soluble in water or fertilizer. These formulations rely on physical agitation to keep small, solid particles suspended in solution. Imagine shaking a snow globe to make it to snow. Unless you keep shaking, the snow rapidly settles. 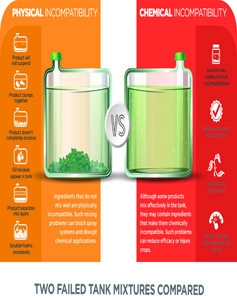 Solid active ingredient formulations are similar. Without agitation, the active ingredients will settle to the bottom of the tank over time. 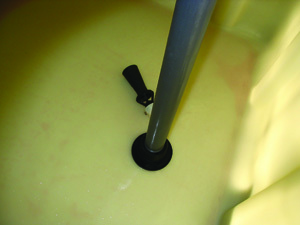 Some formulations will settle to the bottom of the tank without forming a hard layer. Agitating the mix will easily resuspend them. Other formulations may hard pack, which makes it difficult resuspend the particles. In any case, the longer the suspension remains without remixing, the more difficult it becomes to resuspend into a uniform, sprayable mixture. Dry formulations include water dispersible granules (WDG) and wettable powders (WP). The active ingredients in liquid suspension formulations are suspended in a liquid such as water or oil. They include suspension concentrates (SC), oil dispersions (OD), or capsule suspensions (SC). Suspo-emulsion (SE) formulations contain suspended particles and an oil active ingredient (or adjuvant) that has been premixed to ensure they are physically compatible. 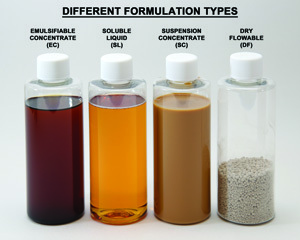 In essence, SE products form an emulsion in the container, while EC products form an emulsion when mixed in water. Dry solid formulations, like water dispersible granules (WDG) and wettable powders (WP), need to be dispersed in water. If the granules are not dispersed, they will not pass through spray equipment. Therefore, each granule needs to break into smaller primary particles that will more easily pass through screens and spray nozzles. 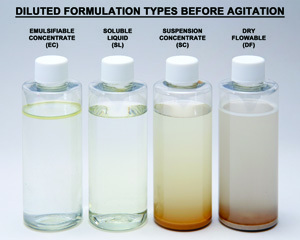 You should mix these formulations first in water using moderate agitation. This will allow the water-soluble surfactants that hold the small particles together to dissolve and release into the suspension. In order for a dry formulation to remain evenly dispersed in water or liquid fertilizer during a spray application, you must continuously agitate the solution. If you allow a formulation with dispersed active ingredients to settle out to the bottom of the spray tank, it may not be possible to resuspend the particles. 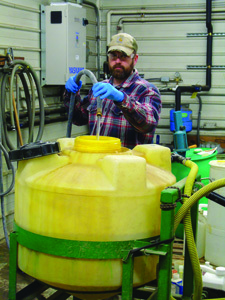 One of the more common tank mix problems with WDG and WP formulations occurs when you add oil-based products or adjuvants to the spray mix before adding the solid formulation products. Since crop oil is less dense than water, the oil will stay on the liquid surface. Consequently, when you place the dry formulation in the spray tank, it first encounters a layer of oil, which coats the dry formulation. And this oil now coating the dry formulation prevents water from reaching the pores of the dry formulation, which limits its ability to dissolve. The end result is that the dry formulation cannot break down into primary particles, which leads to larger solid particles settling or clumping in the bottom of the tank and hoses. 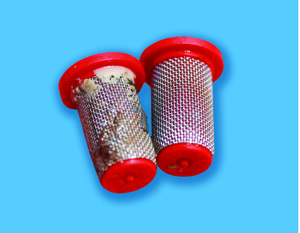 These large particles can clog nozzles and filters. The amount of water you use when you prepare a tank mix can be critical. Therefore, it is important to understand that you need to have a minimum volume of water in the tank before you add the first product. Think of sugar dissolving in a glass of water. Once the water is saturated, the sugar will no longer dissolve and will settle to the bottom of the glass. However, if you increase the volume of water in the glass, it will allow the extra sugar at the bottom of the glass to dissolve into the water. Problems can occur if you have only 5 to 20 percent of the water volume is the spray tank, vat, or inductor cone when you add the first products. This can create a very concentrated mixture that completely saturates the water. This is a common problem for most products. These inductors and vats are commonly used for mixing pesticides. Do not put more than one product in these mixing containers at a time. The risk of incompatibility is greater when you use low water volumes and high rates of crop protection products. Having more water in the tank decreases the chance of problems occurring. Furthermore, compatibility problems may occur sooner when you use low initial water volumes. 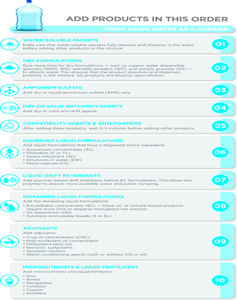 Soluble liquids (SL) are essentially salt solutions. When you use low initial water volumes to combine soluble liquids, solubility becomes a factor — just as in the sugar in the tea example. Active ingredients precipitate out of the spray solution when the active ingredients can no longer dissolve in the carrier due to changes in water properties or to interactions with other products. It is important to follow label recommendations. Typically, directions state that the tank must be half full of water before you add the first product. In addition, using less carrier volume may cause dry materials to clump or form gels. The more carrier that is available to disperse and/or dissolve products, the less likely the product will settle to the bottom of the tank or clog sprayer lines. You should always agitate products in the tank for a certain time before you add another product. Adding products in rapid succession may result in physical incompatibility. Patience is especially critical when the active ingredients do not dissolve in water. Remember, it takes time for some products to completely disperse or suspend. If you add products too quickly (that is, one right after the other), you can interfere with the dispersion and mixing process. It’s also important to consider that just because a product appears to have dispersed does not mean the product has completely dissolved. Products do not dissolve and mix instantly (that is, in two minutes or less). This is especially the case when you mix in cold water (lower than 42°F). You should agitate tank mixtures before and during spray applications. If you do not agitate tank mixtures, then products that have dispersed active ingredients (including water dispersible granules, wettable powders, suspension concentrates, oil dispersions, capsule suspension, EC, and suspo-emulsion) will settle out over time. That said, some sprayers may have agitation that is too aggressive. 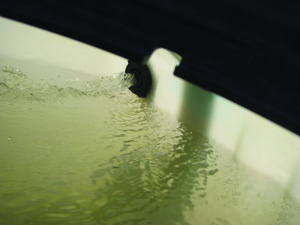 Mechanical agitation (such as paddles in airblast sprayers) and hydraulic agitation (associated with high-capacity pumps) can agitate tank mixes too much and make the tank water like look it was agitated by a high-speed food blender. Too much agitation may result in problems like foaming. Foam is a problem when you add WDG, WP, or WG products to the spray tank. The dry formulations remain on top of the foam and will only partially hydrate. Since the products do not have adequate water available to properly disperse, the products tend to simply swell, and then sink to the bottom of the tank. This prevents uniform dispersion, may clog the pump intake completely, or may cause the pump to lose suction and stop pumping. Over-agitation is also a concern when using dispersed active ingredients — such as emulsions in water (EW) or ECs that form emulsions. Over-agitation may affect the surfactants attached to the surface of a solid active ingredient and cause the surfactants to separate from the active ingredients. This destabilizes the tank mixture, and causes clumping. In this case, too much agitation may create a spray solution that resembles cottage cheese curds. Over-agitation can cause certain polyacrylate or polyacrylamide thickener-type anti-drift agents to lose their effectiveness from mixing shear. 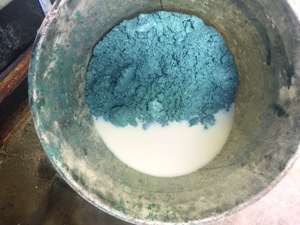 Over the course of the application, the anti-drift agent’s effectiveness will diminish as the remaining liquid continues to be recirculated through the mixing pumps. For this reason, anti-drift agents are often added last. You need to use moderate agitation. 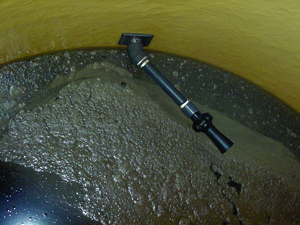 Overall, you want the bypass agitation to be sufficient to prevent particles from settling on the bottom of the tank. 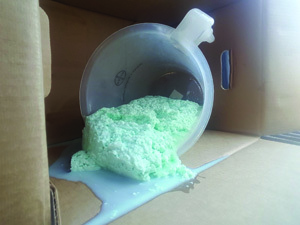 Providing moderate agitation and using an anti-foaming agent early in the mixing process will ensure that all products disperse quickly without foaming. You know you have moderate agitation when you can observe the top layer of the spray tank mixture moving when you look inside the tank. If the spray mixture looks like boiling water, then there is too much agitation. The two most common carriers used for applying pesticides are water and liquid fertilizers (that is, 32-0-0, 28-0-0). About the only similarity water and liquid fertilizer share is that they are both liquids. Generally, water is a better carrier for tank mixtures, because most products are designed to be used with water. Liquid fertilizers are a concentrated salt solution, so there is less free water available to disperse dry formulations and other products in the tank mixture. You must be cautious when you mix multiple products in a liquid fertilizer solution, because compatibility problems are likely to occur. 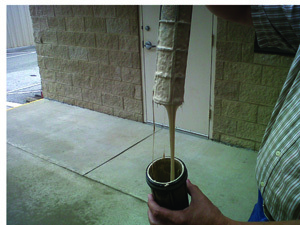 If you use liquid fertilizers as the carrier, always conduct a jar test (see page 34). Understanding the differences between liquid fertilizer and water helps you determine how many products you can add to a mixture. Liquid fertilizers are high-electrolytic solutions that contain charged ions such as sodium, potassium, chloride, calcium, phosphate and/or ammonia. As a result, these solutions have fewer available water molecules to solubilize pesticides. For example, when using 32 percent urea ammonium nitrate (UAN) liquid fertilizer, the high loading of fertilizer saturates the water. This makes it impractical for dissolving other products directly into the spray tank. So, if you were to add water dispersible granules to 32 percent UAN, then you could have partially dissolved granules that would block screens. This is why dry product formulations often recommend that you premix the product separately in water (sometimes called a slurry or preslurry) before you add it to a liquid fertilizer carrier. It is also important to remember that the salts in liquid fertilizes can react with the inert ingredients in your product. Such reactions may cause incompatibility issues. This jar contains liquid fertilizer. It may look like water, butinteracts differently in the tank. 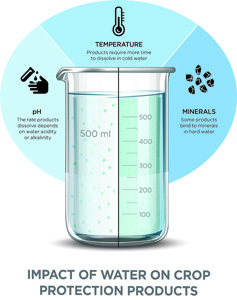 Water temperature can influence the rate that products dissolve, disperse, emulsify, and flow. Think about adding sugar to your iced tea again. When you put sugar into cold tea, it settles directly to the bottom. However, when you add sugar to warm tea, the sugar dissolves quickly. In general, more material dissolves in warmer water than in colder water. 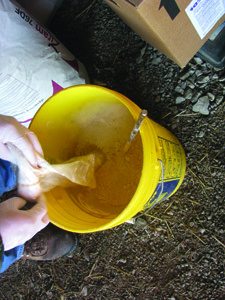 Dry formulations and liquid flowables take more time to disperse when the carrier temperature is cold (about 42°F). When mixing products into cold water, allow at least three to five minutes for each tank-mix partner to dissolve and disperse before adding the next product. Alternately, consider preparing a slurry in warmer water, and then adding the slurry to the cold water. Cold water also can also cause problems with emulsifiable concentrates, crop oils, and seed oils. These formulations contain surfactants that help them mix properly — they form a characteristic milky bloom when mixed in warmer water. But in cold water these formulations instead form gels that are difficult to disperse. This leads to the active ingredient being unevenly distributed in the tank. And cold water can cause problems with water-soluble packets. These packets work a lot like the prepackaged dishwashing soaps that readily dissolve in warm water. The packaging dissolves more slowly in cold water. If the packaging does not completely dissolve, it can plug nozzle and pump intakes. It is especially important to allow water-soluble bags to fully dissolve when using airblast sprayers. If you place these bags into a tank that is less than half full, they may not dissolve properly, which can end up blocking the pump intake. to test, so you basically experiment every time you tank mix. When you add a new product to the mix, you should anticipate incompatibility problems. Always follow the instructions on the product’s label. You may have used the product for 15 years without any problems. However, it’s important to remember that manufacturers periodically reformulate products. Perhaps they keep the same active ingredient and brand name, but change some inert ingredients. Such new formulations and technologies may result in different reactions than what you were used to seeing. 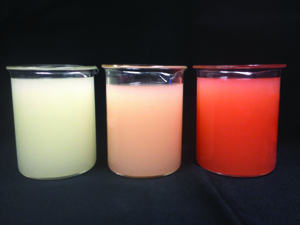 In the past, pesticides and similar products were liquid formulations that contained a single active ingredient — they were soluble liquid (SL), flowable (F), or emulsifiable concentrate (EC) formulations. 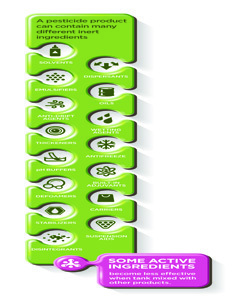 New formulation types can contain multiple active ingredients and be applied at lower rates. Such formulations often require constant agitation to assure uniform application. This is because the active ingredients suspend in the carrier rather than create a solution. 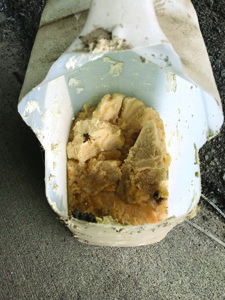 The technical complexity of some of these newer, multiple active ingredient formulations can create new and unexpected tank-mix compatibility concerns. Formulations like emulsifiable concentrates can be used at lower use rates (from quarts to ounces per acre) because they use solvents to dissolve the active ingredients. However, this creates a problem when you add oil-based products (or emulsifiable concentrates) before other formulations — there may be interactions between oil-based and other products. This typically occurs with dry formulated products. Therefore, it is important to understand mixing order. As we’ve already noted, formulations change, so you must constantly examine key tank mixes before applications. Effectively mixing multiple products is not that difficult as long as you follow the label information and understand a few basic mixing principles. On the following pages, we present some general recommendations for tank mixing order when using water as a carrier and when using liquid fertilizer as a carrier. When you use water as a tank-mix carrier, follow this general mixing order (also see the General Mixing Steps — Water as a Carrier graphic below). 1. Read all product labels. First, know what kind of formulation the product is. Some products will list their formulation types after the brand names, but many do not. If necessary, contact the manufacturer to determine the pesticide formulation type. some may differ from the order described here. 2. Shake all liquid product containers. so that you thoroughly mix the active ingredient and inert ingredients together. Bulk tanks require recirculation, totes need to be recirculated, or preferably, remixed with a tote mixer. 3. 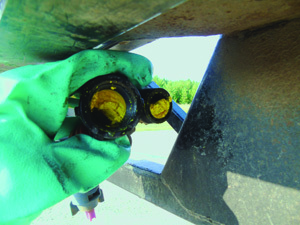 Fill the spray tank with 50 percent of the required water volume. 4. Start the agitation and continue through the mixing process. Never add multiple products to the inductor at the same time. Before adding the next product, flush the inductor with clean water. 5. Add products based on formulation type in the order shown in the graphic to the right. 6. Wait three to five minutes before adding products after dry formulations. Dry formulations include wettable granules (WG), soluble granules (SG), and dry flowables (DF). If you use water-soluble packets, visually ensure that the bags have fully dissolved and the product has dispersed before you add more products to the spray solution. You should continue agitation until the tank mixture appears uniform. 8. 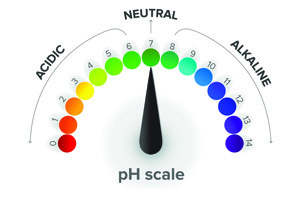 Measure the pH of your spray solution. You can determine the proper levels of water conditioners or ammonium sulfate you need to add. Only add pH adjusters at the end of the mixing process to ensure that the final spray solution is in the pH range specified by product label. In other words, determine the actual pH of the tank mixture and its desired pH before you add a pH adjuster. But use pH adjusters with care. Acidifiers can lower the pH of the tank mixture too much, causing some active ingredients to precipitate out of solution or to volatilize. 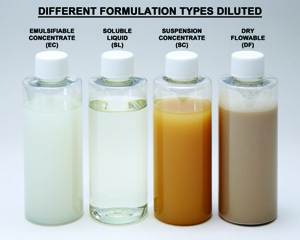 Keep in mind that defoamers, pH adjusters, and compatibility agents are not subject to typical mixing order protocols. Product labels will indicate if such products are required. Labels also commonly direct you to add these additional products to the tank just before you add the pesticides. 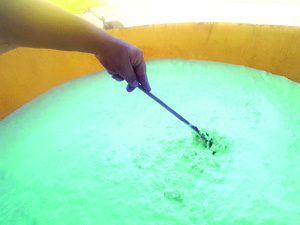 Anti-foamers suppress foam during the mixing process. Do not add the entire amount of anti-foamer to the tank mixture at the beginning; instead, divide into two or three parts. Add the remaining amounts at the end of the mixing process when the tank is nearly full. Measure pH After Mixing Always measure your mixture’s pH at the end of the mixing process. This will help verify that the final spray solution mixture is in the desired pH range (and allow you to adjust it if necessary). Remember to carefully check labels — some products prohibit the use of pH adjusters. When you use a liquid fertilizer (32-0-0, 28-0-0, 10-34-0) as a tank-mix carrier, follow this general mixing order (also see the General Mixing Steps — Fertilizer as a Carrier graphic below). Second, look for label information about optimal water pH, about the influence of hard water, and about the need to add adjuvants like surfactants or oils. Make sure to shake them before you dispense them into the tank so that you thoroughly mix the active ingredient and inert ingredients together. Bulk tanks require recirculation, totes need to be recirculated, or preferably, remixed with a tote mixer. Always wear personal protective equipment when handling pesticide products. If you haven’t made a particular tank mix before, jar test the mixture before messing up hundreds of gallons (see Jar Test, page 34). 3. Fill the spray tank with 50 to 75 percent of the required fertilizer volume. 4. Never premix products in an inductor. 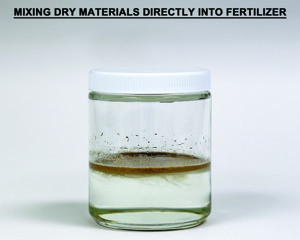 Some products are not designed to be added directly to liquid fertilizer mixtures. Instead, you must premix these products with clean water. An example of an inductor. 6. Add remaining fertilizer to the sprayer. 7. Inspect solution for signs of incompatibility such as separation. 8. Continue to agitate mixture until it is applied. (Left) When you add a dry herbicide directly to 32 percent UAN, it sits on the top. (Right) And even after agitatation, the herbicide looks like it is not fully solubilized in the solution. This shows the need to pre-slurry the herbicide with water before adding it to the tank mix. (Left) The herbicide was pre-diluted in water, and then added to UAN fertilizer. 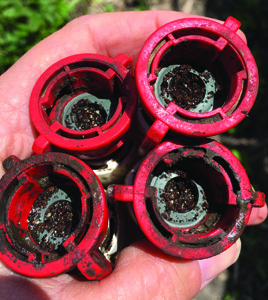 (Right) After agitation, the diluted herbicide mixture combined with the fertilizer carrier to create a more uniform solution that could be sprayed without clogging nozzles. 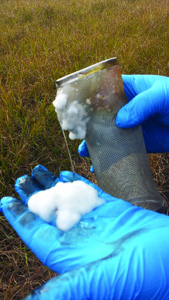 Tank mixtures are susceptible to variations in chemistry, equipment, and water quality. In order to ensure that the products will mix together well, you should conduct a jar test before mixing in the tank. Instead of mixing (and potentially wasting) large volumes of products in the spray tank, the jar test allows you to test product combinations for compatibility first. 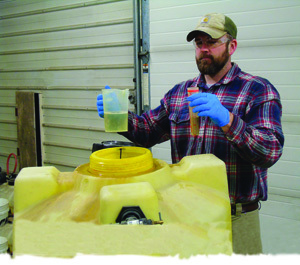 Jar tests are particularly important when you mix products in a liquid fertilizer carrier and when you mix more than two products (pesticides, adjuvants, fertilizers, micronutrients) in water. You may use the same brand of products from one year to the next. However, manufacturers often change the inert ingredients in their products. These changes might alter how the product interacts during mixing. So, even if you’re making the “same” tank mix you’ve always prepared, you should still conduct a jar test to help identify potential compatibility issues that may occur with even slightly different inerts. 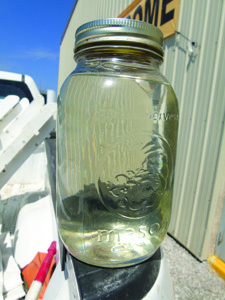 It is important to use the same water source and temperature for the jar test that you will use in your tank mix. You should actively practice this for all ingredients, since bulk tanks may be colder during mixing than just a small sample from a 2.5-gallon jug mixed indoors. 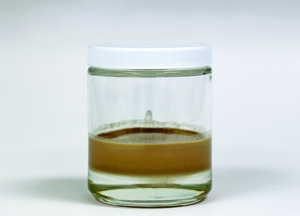 A jar test simulates what occurs in a tank mixture and will provide evidence of physical incompatibilities such as separation, settling, inversions, and oil residue buildup. You should always conduct a jar test before mixing, especially if you are tank mixing products that you have not used before. Always follow product label directions on how to conduct jar tests for specific products, because different products may require different water volumes. 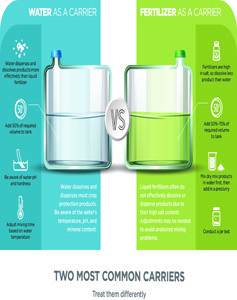 When you use less water, many products will be incompatible (bottle on left). When you start off with more water, products mix better (right two bottles). The labels for most products provide instructions for jar tests — they usually involve measuring products with cups, teaspoons, and tablespoons into glass or plastic containers. However, commercial compatibility test kits are also available. If you use a commercial test kit, always follow instructions on how to conduct a jar test. For this publication, we will discuss the Precision Lab-oratories Compatibility Test Kit (www.precisionlab.com). The instructions for this kit are based on 1 milliliter (mL) representing 1 gallon of liquid. The clear plastic polyvinyl chloride container that comes with the kit holds 120 mL, but is marked at the 100 mL level. Thus, 100 mL is equal to 100 gallons of water. 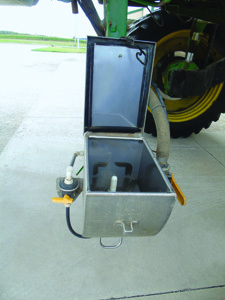 The mixing container is calibrated based on the number of acres a 100-gallon tank will cover. Purdue Pesticide Programs offers a video — “How to Use a Compatibility Test Kit” —that describes how to use one of these test kits. Visit ppp.purdue.edu. We recommend that you keep detailed records for specific tank mixture preparations. Keep track of problem tank mixes (so you avoid repeating them) and successful mixtures for easy reference in the future. nor condoned by the authors nor the manufacturer. 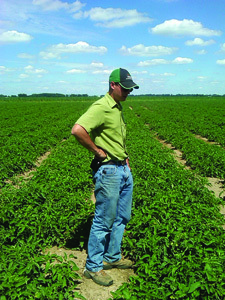 Purdue Pesticide Programs offer a number of publications on related topics to help you manage your operations better. All publications are available from The Purdue Extension Education Store: edustore.purdue.edu 765-494-6749. 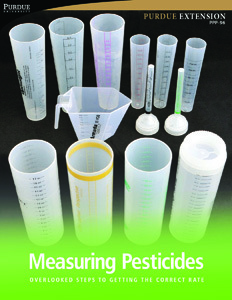 Measuring Pesticides: Overlooked Steps to Getting the Correct Rate (PPP-96). Understand effective measuring techniques that ensure success. 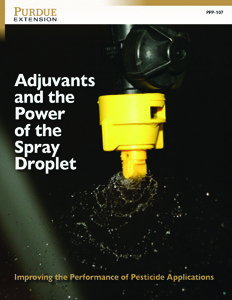 Adjuvants and the Power of the Spray Droplet (PPP-107). Understand how adjuvants can improve pesticide effectiveness. 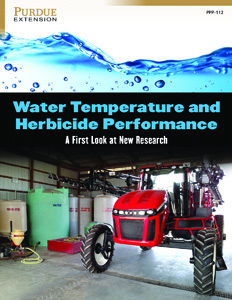 Water Temperature and Herbicide Performance (PPP-112). Understand how cold water influences efficacy. 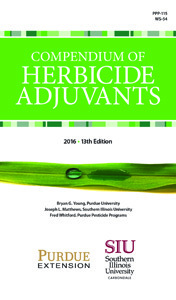 Compendium of Herbicide Adjuvants (PPP-115/WS-54). Understand what each adjuvant brand name does in the way of improving pesticide efficacy. age, national origin or ancestry, marital status, parental status, sexual orientation, disability or status as a veteran. Purdue University is an Affirmative Action institution. This material may be available in alternative formats.